5 Ways to Create Sidewalk Sign Messages that Pop! 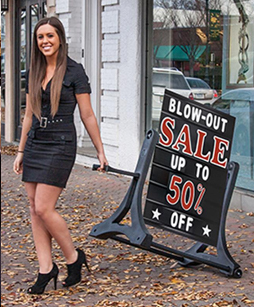 Sandwich boards and sidewalk signs are some of the most common advertising displays used by local businesses. Part of the reason for their popularity is that they are very economical yet they provide users with lots of features and versatility, especially if they are designed to be written on or come with a set of changeable letters. Customizable designs give retailers and restaurant owners the ability to tailor their signage and information, so potential customers are more likely to enter the business. Because sidewalk signs can have such a massive effect, it is extremely important that the displayed message is well crafted. With that in mind, let’s take a look at some ways to develop effective sandwich board messages. Local businesses operate storefronts in a wide variety of neighborhoods, from busy downtown districts to suburban and residential areas. Many local shops rent or lease spaces that aren't exactly ideal. In fact, it's safe to say the vast majority of businesses certainly do not build their own buildings (at least when they first open), so it's no surprise that small business owners often experience the pitfalls of less-than-optimal locations. One of the most common problems for small business owners is designing and hanging a sign that everyone can see. Pedestrians and motorists often pass by businesses and do not have a clear view of overhead signs. Because sandwich boards are lightweight, they can easily be placed at a variety of angles right in potential customers' line of sight. 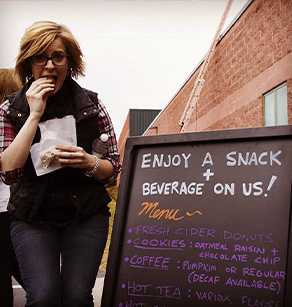 Restaurants and cafés commonly use sandwich boards for displaying their daily specials or popular menu items. By writing a few food and beverage options on a sidewalk sign, you can give potential customers a taste of your menu before they even walk through your doors. If customers catch a glance of something that sounds appetizing, they may have to stop in for a bite to eat. Many bars and restaurants have recurring specials for each day of the week, which makes managing a sidewalk sign promotion even easier. In this case, you can simply list the days of the week and the corresponding specials on your board. 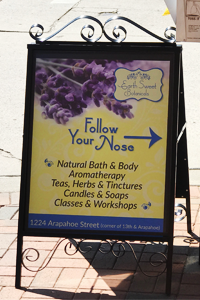 A custom-printed sidewalk sign is a great option for this, especially if you don’t have the best handwriting – you can print a stylized template for your weekly calendar, and write specials as they change, or print your entire sign without the need to update. For a professional appearance, you should also consider branding your outdoor sign with your logo or other graphic elements to coordinate with your business's other promotional displays. Retailers can use custom-printed signs and letter boards to advertise store sales, promotional prices, limited time offers, and loyalty perks for their customers. By placing key promotions outside, business owners are extending the reach of their campaigns and making their sales stand out. When pushing a sale, it's often a best practice to use large numbers and vibrant text on your sign. This makes your offer easy to read and understand from far away. Additionally, bars use sidewalk signs to promote special events like game nights, live music, or DJs. Placing these promotions just outside the entrance helps to generate interest before your event and attract pedestrians during. In recent years, humor has played an increasingly important role in advertising. 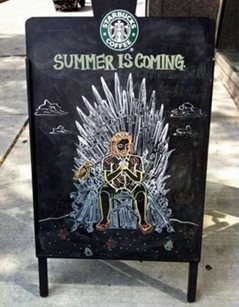 Sandwich boards are commonly set up with funny, quirky, and downright strange messages that are intended to put potential customers in the right mindset for making a purchase. The saying "laughter is the best medicine" could be reimagined as "laughter is the best advertising strategy." Happy, entertained customers are much more likely to make a purchase. Additionally, lots of customers appreciate the less serious, human element that comical messages provide. 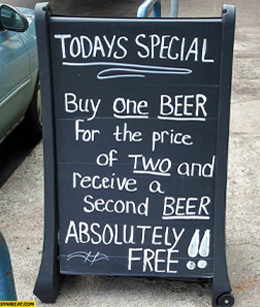 Funny sandwich board messages are so common now that there are tons of image compilations of the funniest examples on the web. Who knows? Maybe one of your funny sidewalk signs will go viral! You can even take your funny messages one step further by adding topical references. Featuring popular TV shows, movies, music, sports teames, and news stories in your sidewalk sign messages will show customers that your business has a human side. For example, if a bar offers a new drink called the "Walter White", you can bet that a lot of Breaking Bad fans will want to give it a taste. Leveraging pop culture is one of the easiest ways to attract new business. These simple tips will give you an edge on your competitors and help you create effective messages that drive more people into your business. Think about how each tactic can benefit the various campaigns your company runs. You can even consider combining several of tactics together in one message for even more impact. Humanize your business again with unique, exciting messages that people can't help but read and you will not regret it!